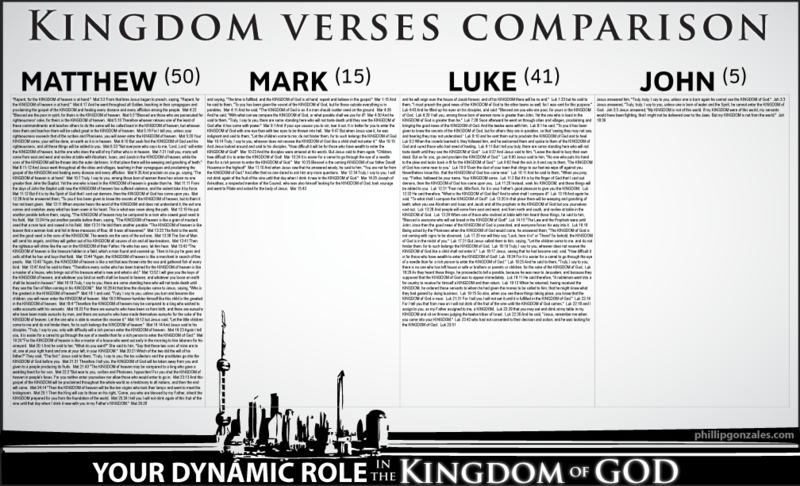 In doing a study on “The Kingdom of God”, I wanted to show visually the comparison between each of the Gospels, in terms of how often they talked about “The Kingdom”. This PDF is the result. I’ve left in verse references, but stripped out section headings or other things not directly related to the text. I’ve also removed verses that mention the word “kingdom”, but that are not related to “The Kingdom of God/Heaven”. The numbers next to each book name are the number of times that Gospel mentions “The Kingdom”. Enjoy! I like this graphic illustrating just how often the kingdom of God is referred to in the gospels. It’s so easy for me to loose track of the greater purpose God has for our lives for the day to day distractions and His desire for us to be a part of His kingdom.